One of the first things you see when reserving your free copy of Windows 10 is that it’s “designed for speed”, promising you faster boot times, resume times, and more. 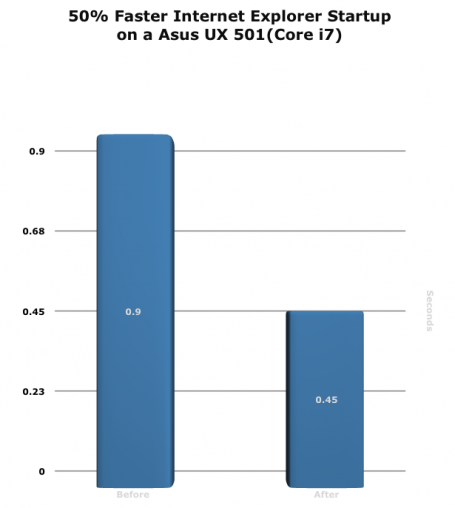 But is Windows 10 really that much faster than its direct predecessor? We put it to the test and show you how the new OS fares in multiple scenarios such as boot time, performance while working, smoothness of gaming, and battery life. 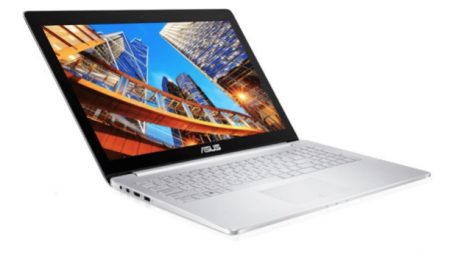 In our lab, we started our tests with a rather high-end multimedia notebook – the Asus UX-501. It’s equipped with a Core i7 (which clocks up to 3.6 GHz), 16 GB of RAM, a rather powerful GeForce 960M GTX and a blazing-fast 128 GB SSD. It’s one of the hotter devices of 2015, and should definitely show if and how much Windows 10 is able to speed things up compared to the pre-installed Windows 8.1. For “boot time” tests, we used Microsoft’s “Windows® Performance Toolkit”: These tools are used by software and hardware makers to test the impact of battery life and performance of their products on typical machines. The difference isn’t huge. But it suggessts Microsoft is working hard to shave off boot time: 9 versus 8.3 seconds isn’t something you feel on such a powerful device. On a slower PC or laptop, it could translate into a far higher benefit. During a typical work day, applications get launched and closed all the time. Long load times aren’t just an annoyance to the user, they could even hinder the ability to work or browse the web properly. This is why we used Windows Assessment Toolkit to measure how long it takes to launch an application, in this case Internet Explorer. Again, a reduction from 0.9 to 0.45 second is something only a few people would notice. 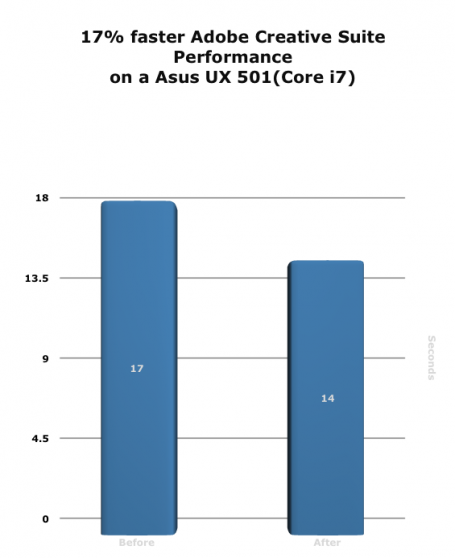 Yet it's more evidence how Microsoft is improving performance. 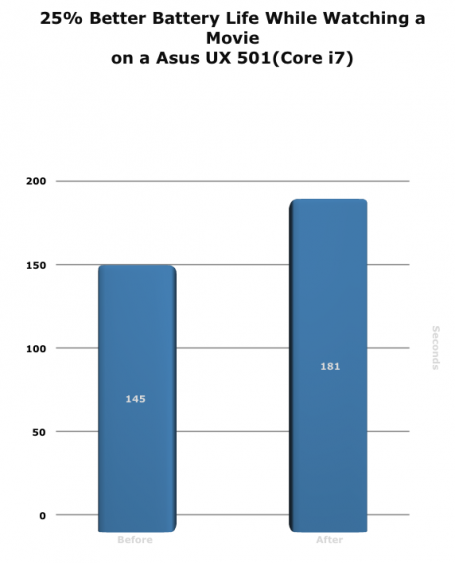 The numbers you see in the graphs represent the time it took to complete the browsing benchmarks. Unfortunately, in this instance, the results really weren’t that different. A 0.11s difference is completely within margin of error and doesn’t have any real-life effect. The next test involved PCMark running automated actions in Word, PowerPoint, and Excel to measure performance, such as converting and calculating a huge Excel file. We were impressed: In all test iterations, Windows 10 was able to run 8% faster when working with the Office suite. Thanks to the ubiquity of services like Steam and the increased sales of capable PCs and laptops, gaming applications are not just some of the most popular applications on PCs, but also the most resource-intensive. 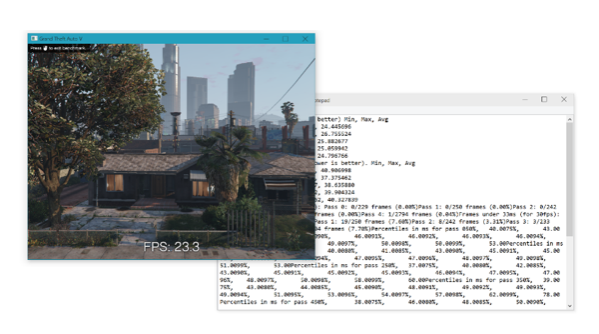 This is why we used the top game of 2015, Grand Theft Auto V, and its built-in benchmark tool to measure the average FPS (Frames per seconds) for different scenes and scenarios of the game. 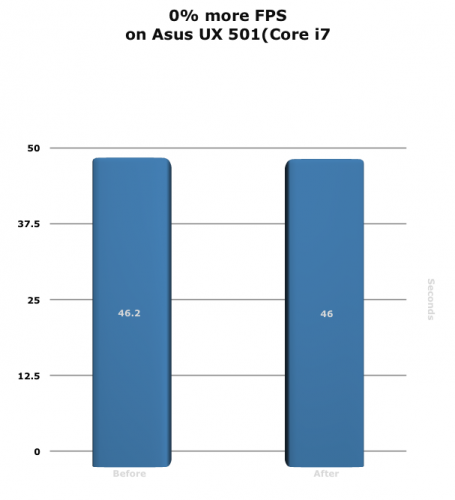 Windows 10 actually performed slightly slower, but also within testing tolerance. However, one of the main benefits of Windows 10 is the exclusive implementation of Microsofts graphics platform DirectX 12, which is supposed to speed up games by to 50% – unfortunately, we’re still waiting for compatible titles, so there’s no way to really put this to test at the moment. While the last couple of tests focused more on consumer activities, such as browsing the web or working with Office, professionals often need higher levels of performance. So we put the systems to the test with Adobe’s Creative Suite. 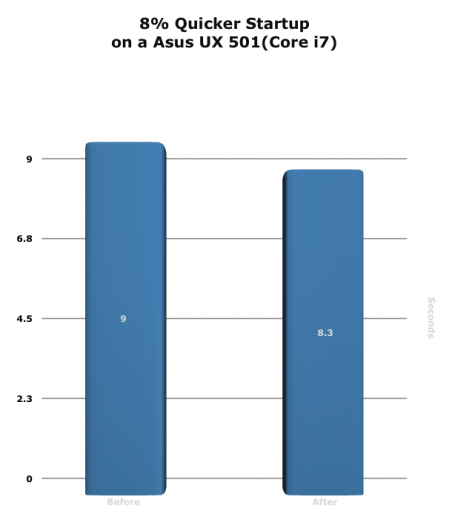 Again, Windows 10 showed better results, likely due to the improved resource utilization and improved driver support. In all three test iterations, Windows 10 managed to run 9 minutes longer. Not a massive improvement, but definitely noticeable. That's right. 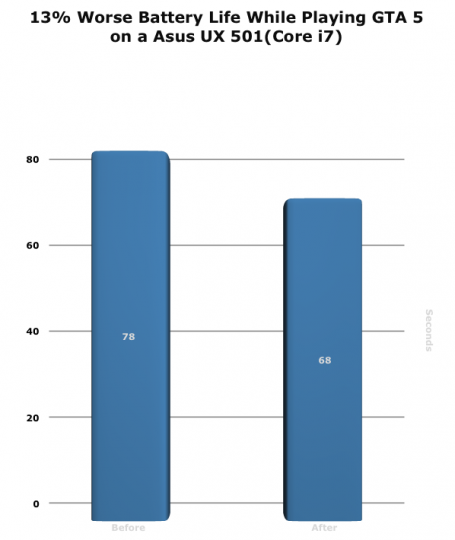 Windows 10 showed a reduction of 13% in our tests. We’re hoping that NVIDIA and Microsoft are working closely on a new driver to fix this issue. Given the gaming test, it came as a surprise that our movie tests showed some significant improvements for Windows 10. When watching a 1080p video clip in a loop using Windows Media Player on Windows 8.1, the laptop died after 2 hours and 25 minutes. When using Windows 10, it lasted a whopping 3 hours. Windows 10 probably does something in the background to reduce resource usage during movie playback. 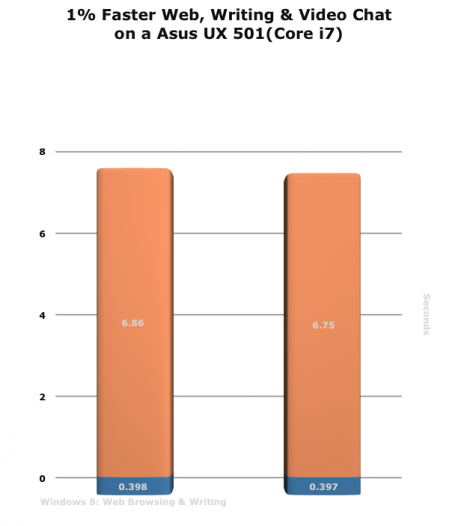 Windows 10 – even in its first release – is a tad faster than Windows 8.1. But it isn't magic. Some areas improved only marginally, though battery life did jump up noticeably for movies. Also, we tested a clean install of Windows 8.1 versus a clean install of Windows 10. 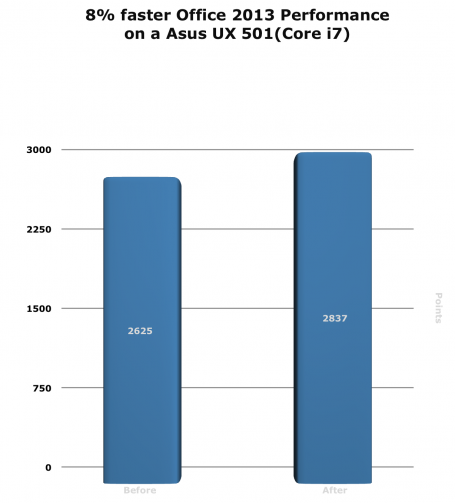 The areas in which operating systems really suffer from performance is the gradual slowdown that occurs over time and with more and more programs or drivers installed. 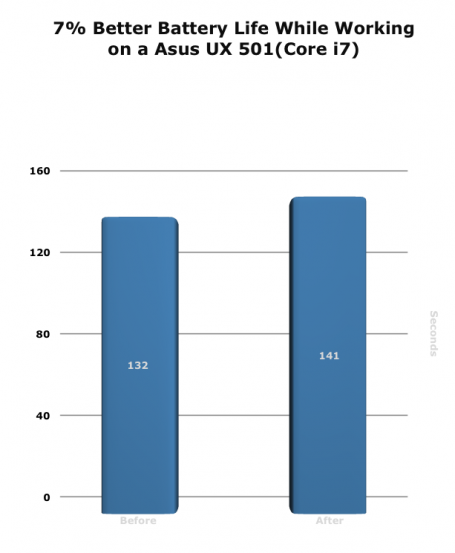 That’s why, in our next blog, we will install 150+ programs on new Windows 10 devices to see how much the new OS handles load – and what we, as AVG, can do about it!